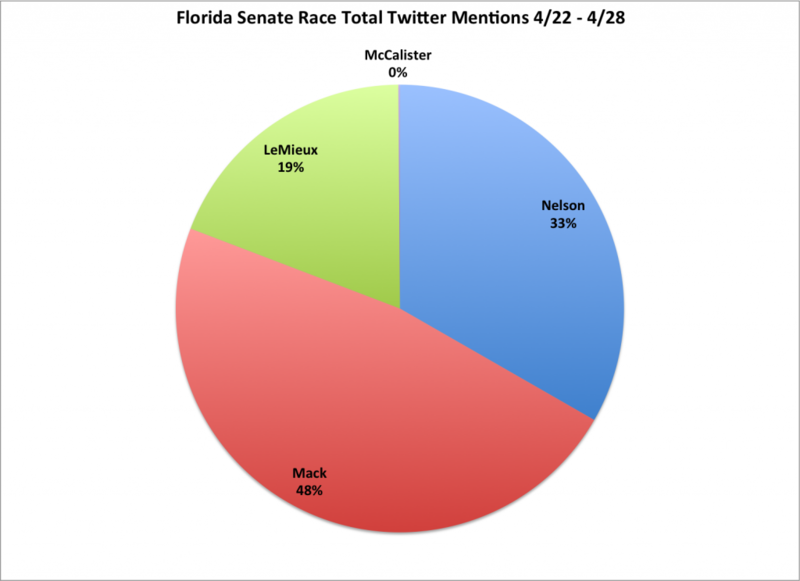 Bill Nelson came in second, but far behind Mack. LeMieux had a fairly small presence, and McCalister having so few tweets recorded that I had to go back and review it by hand to make sure my program didn’t have a bug! Connie Mack’s spike on 4/24 appears to be from two things: (1) many retweets of his congratulatory tweet to Romney for winning the primary, and (2) comments about his appearance on Chuck Todd’s show on MSNBC where Mack refused to say how he’d vote on student loans. A lot of those comments were not positive. Still, by dominating the news, Connie Mack is sucking the oxygen out of the GOP primary race. That’s one of the advantages of holding a similar office — Mack is relevant today on issues that the winner of the race will confront next year. 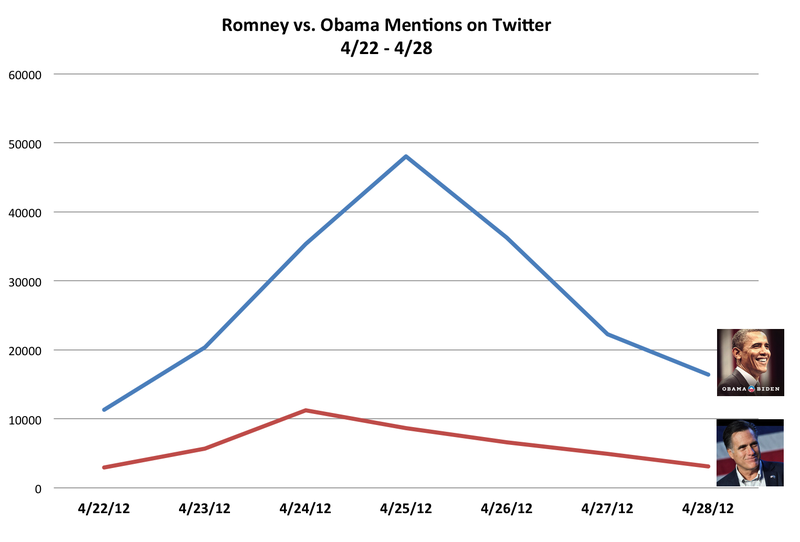 We can see the next day Twitter was abuzz. There’s been criticism of the President from the conservative side of things about the appearance, but it’s clear as a political move it was shrewd. We’ll see in next week’s analysis whether Saturday’s appearance at the White House Correspondent’s dinner will have the sam effect. Are Police using Social Media to Monitor the Occupy Movement and Others? CBS news has an interesting piece about how the police are using Social Media to “monitor” (their word) the activities of groups like Occupy Wall Street, citing one case where prosecutors sought to use the Twitter feed of a protestor arrested for disorderly conduct. The article mentions a report from the International Association of Chiefs of Police that said that roughly 90% of US law enforcement agencies have used social media. What’s interesting, though, is that it appears that a lot of the usage has nothing to do with crime, per se. The report covers both the investigative uses of social media as well as more mundane things like creating a facebook page for police departments. The report does say that about 71% of the agencies have used Twitter for crime investigation, but that’s a fairly loose description — and when law enforcement is tasked with crimes that take place at least partially online, it’s not surprising that some one would look into the Twitter postings of a suspect. 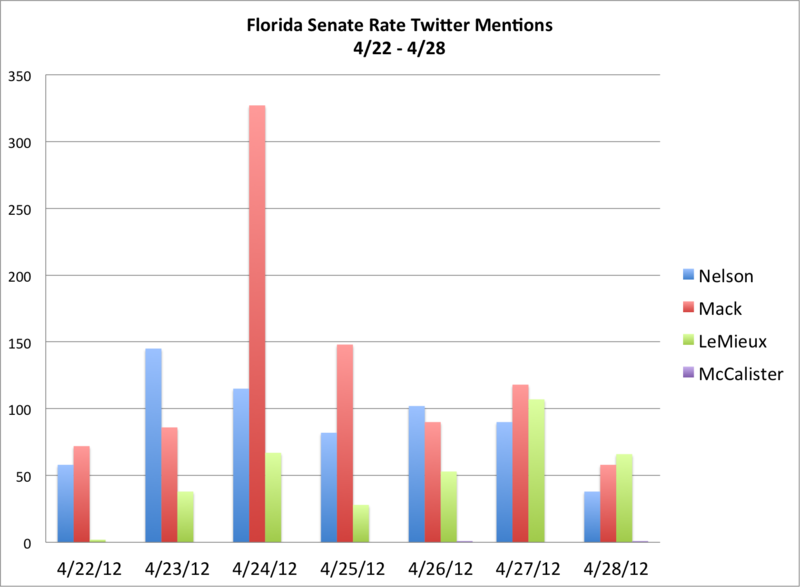 Did the Republicans hijack the Hashtag #DontDoubleMyRate ? You see a lot of comments on Twitter and elsewhere that the republicans managed to hijack the hash tag #DontDoubleMyRate to use to express opposition to Obama. Usually, these comments come with a lot of glee that the conservatives have out-smarted the liberals. So, did the hashtag get hijacked? There were 48578 tweets between 2012-04-18 11:04:19 and 2012-04-28 12:49:03 that used the hashtag. Of those, only 14% or approximately 7,000 contained anti-Obama or just conservative messages. There were probably as many spam messages! The conservatives can say, all they want, that they managed to take over #DontDoubleMyRate, but the facts in this case, as Steven Colbert says, have a liberal bias. A random sample of 376 tweets out of the total 48578 were selected programmatically and then read, by me, to be assessed as being either “conservative” or not. I was generous in my assessment, as some tweets are not terribly articulate. 54 of them were plausibly conservative. 54/376 = 14.36% Thus, the estimated percentage of “conservative” tweets is 14.4% +/- 3.5% with a 95% confidence level. At a 99% confidence level, the +/- is 4.6%. 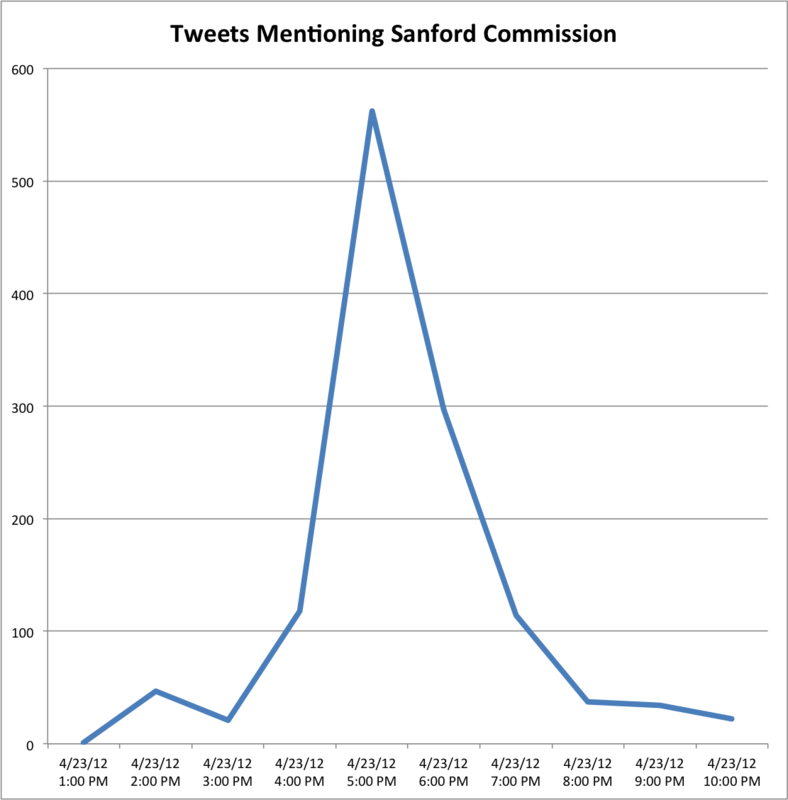 It’s interesting that the talk on Twitter spiked the way it did — there does not seem to be sustained outrage, at this point, about the commission’s actions. You can read the Orlando Sentinel article I linked to for coverage of the event, including the reasons given for not accepting the resignation. Personally, I think it’s a bit of a gamble for the city. If Zimmerman is convicted, then maybe pressure on the city and the police will fade away. But if Zimmerman is not convicted, there’s going to be harsh questioning of whether the police’s handling of the case “lost the conviction.” Pressure, then, to fire the police chief is going to be nearly irresistible, and the commissioners are going to face some awkward questions about why they didn’t take today’s opportunity. And there’s going to be a lot more talking on Twitter about it.